As I write this I’m preparing for the last trapping survey of the Urban Bat Project 2018 season. By the end of this weekend, we will have undertaken 36 trapping surveys, 3 emergence surveys, 9 activity surveys and 2 days of bat box checks. A total of 42 volunteers have contributed a total of 2,530 hours to the project (which our funders, Heritage Lottery Fund, value at an equivalent of £57,300). The project has generated well over 400 biological records comprising bats in the hand and bat detector records for 17 sites. Many of the species records were new to the site in which they were recorded, with new species records added for every site we visited. I thought it fitting to talk a bit about what happens to these records now, what their value is and how they can be used to directly affect bat conservation in our county and region. In particular, I want to talk about what happens if nothing is done with records like these. The basics of biological recording are the four ‘W’s: Who, What, Where and When (i.e. Who recorded the species, What species was it, Where was it and When was it recorded). There are many other aspects which may make up biological records such as the method of recording, the person who confirmed the identification (the Determiner) and other information such as the stage of life of the organism (alive/dead/juvenile/adult/flowering) and even behaviour (foraging/calling/amplexus/commuting), all of which can tell us a lot about the species. 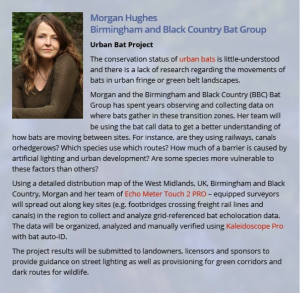 But perhaps more importantly, is the use of BRCs data to inform planning applications – allowing developers, planners and ecologists to know when certain species are in the proximity of a proposed development. This triggers survey requirements, which in turn informs mitigation, translocation and compensation schemes – directly affecting the conservation status of the target species in the area. Without the records, the planning system simply cannot protect the species or their dwelling places. But not everyone submits their records, and this can happen for several reasons. In my experience, when naturalists’ elect to withhold their records from the BRC or county recorders, it is in the erroneous belief that they are ‘protecting’ the species from public knowledge – what I call the Gandalf Theory (“Keep it secret. Keep it safe.” – see what I did there?). This well-meaning concealment of species records is actively detrimental to the conservation of species. People who sit on their closely-guarded records are causing more harm than good. This habit is particularly prevalent in two main taxa: bats and badgers. It is understandable (as badgers are persecuted to this day by badger baiters, and are much maligned by many farmers due to misunderstandings about how bovine TB is spread and the ineffectiveness of the badger cull in combatting it) that people recording badger locations would be inclined to be secretive about sett locations. Likewise, many bat recorders will not submit roost records (particularly of rare species) in an attempt to reduce disturbance at those roosts. However, if the BRC does not know about a roost, the locations of those roosts will not be returned in a records search, and structures, habitats or roosting features may be overlooked, disturbed or even destroyed due to nearby development, when a single roost record would have triggered surveys, assessment, avoidance, mitigation or compensation for any potential damage or loss. 1. 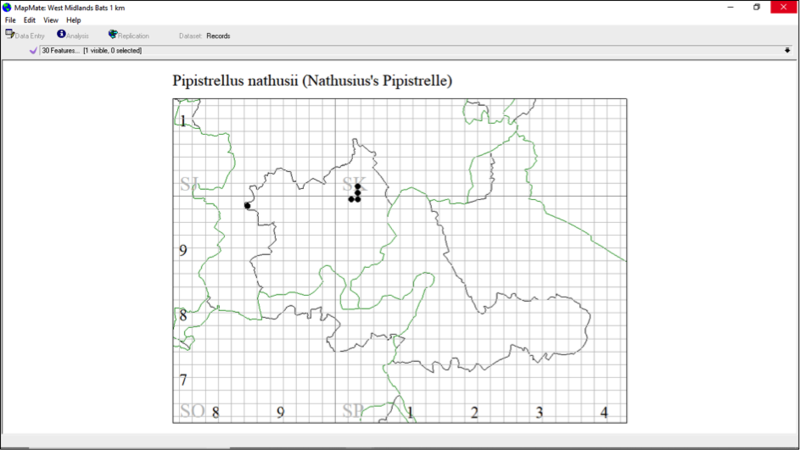 MapMate. This inexpensive and easy-to-use software is what I use to record, collate and export my data each year. Pros are that you can make pretty distribution maps, easily search, run queries and export your data to Excel, share data with other users. Cons are that you have to learn to use the software, and that you have to shell out £30(ish) quid to buy it in the first place. 2. iRecord. (Also on Google Play/Apple Store). I used to use the iRecord App to submit my records for bat box checks, and I found it very effective for on-the-fly recording, for which I still use it. Pros are that you can export your data from the iRecord website, all records are verified and submitted (eventually) to the appropriate BRC. 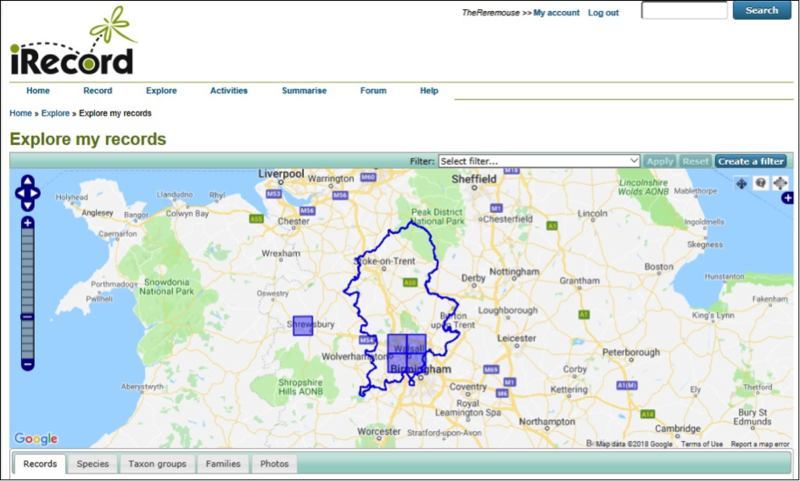 Cons are that when you extract your data, the resolution of your record locations is poor, regardless of how detailed your grid references were in submitting them, which has meant that I’ve stopped using it for most recording purposes. 3. Excel. This is probably the most sensible, and I did this for years. If you email your BRC and ask them for a template, most will be able to send you an Excel form to fill in, and you can simply keep your records, submitting the spreadsheet at the end of each year. Pros are that it is simple, universal, and free. Cons are that there are no pretty maps or apps to use. Whatever way you choose to do it, please submit your records. You can record all the wildlife you like, but if your data are sitting in your field notebook, it is not helping biodiversity and you’re not being effective. Biological recording is the easiest and most effective way that amateur and professional ecologists/naturalists can affect real change for biodiversity. Header image: Brown long-eared bat. Credit: Morgan Hughes. It’s free, international, has great apps, and you can extract your data however you like. It is also a recording community, and once your records have been ‘verified by the community’, they get uploaded to GBiF. In theory, GBiF syncs with the NBN, which in turn syncs with LRCs, but I’ve not checked yet to see if this actually happens.